Because Melbourne’s climate was not suited to his respiratory condition and lead to constant bouts of pneumonia, George Symons brought his family to live in Queensland in 1950. After a short stint in Ipswich they settled in Brisbane. 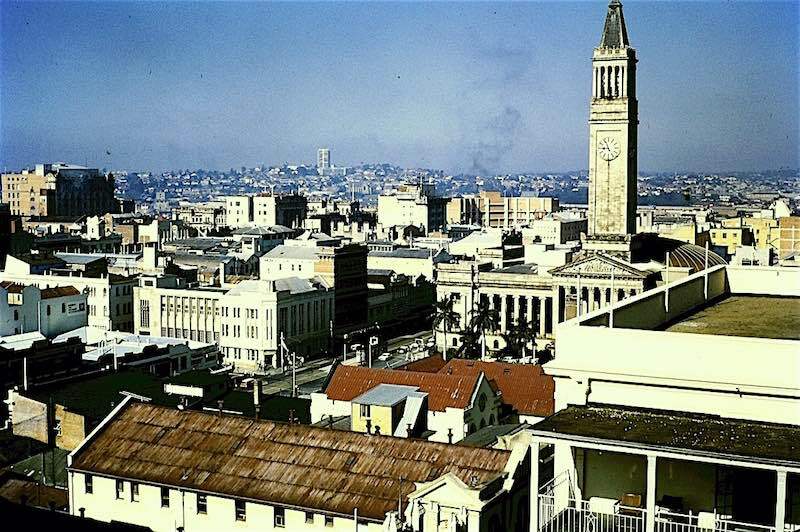 Although its population was just over 500,000, Brisbane in the 1950s, had the reputation of being ‘Australia’s biggest country town’. It slumbered, still wrapped in the euphoria after the end of World War II and hopes for the future, as families settled back into a normal existence, boosted, too, by the cessation of rationing of petrol, butter and tea. The City Hall tower was a Brisbane landmark, and towered over all the other buildings in the city centre. Its shops opened on weekdays from 9 to 5 and on Saturdays from 9 to 1 pm. Sundays were a day for rest and church attendance – and the Sunday roast. ‘Eating out’ was a rare family occurrence, and was reflected in the lack of nightlife in the city. Pubs closed at 6 pm resulting in the so called ‘six o’clock swill’. Greeks still owned and operated the majority of cafes in Brisbane, and their long shop hours enabled workers to snack before work, or after the pictures at night. Friday night was the family’s night out at the pictures in the city at the Regent and Wintergarden Theatres in Queen Street while around the corner in Albert Street the St James and the art deco Metro theatres vied for business. Every suburb, too, had its own picture house with deck chair for the audience to sit in. On Saturday afternoons the kids attended their matinee sessions – noisy affairs with much enthusiastic shouting! 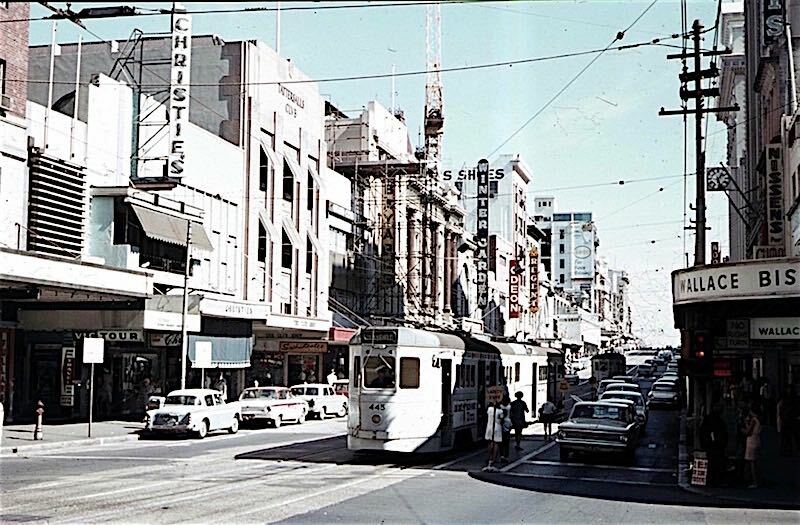 To get around, people caught trams that trundled along Queen Street, and out in all directions to the suburbs. At Christmas the man from Hunter Brothers would leave his crude Christmas card as a reminder of his year’s service to the household’s backyard dunny, and the following week the family would leave out a carton of Fourex longnecks for him as thanks. There were all sorts of home deliveries, too: early in the morning, the milkman would have replaced the empty milk bottles left out on the back step with ones full of milk each with a thick collar of cream – and the change if you didn’t have the correct money for him. On the front lawn, or in the bushes or trees, would be the day’s ‘Courier Mail’ newspaper neatly folded into a square for easy throwing from the delivery car. At night on the way home from work, paperboys hawked the ‘Telegraph’ newspaper for workers to read the on the tram trip home. There were also deliveries from the baker and the aroma of freshly baked bread on lifting the lid of the bread tin. A van also would come around with fresh fruit on display for housewives to come along and choose from. However, the post war peace in Brisbane was not to last. 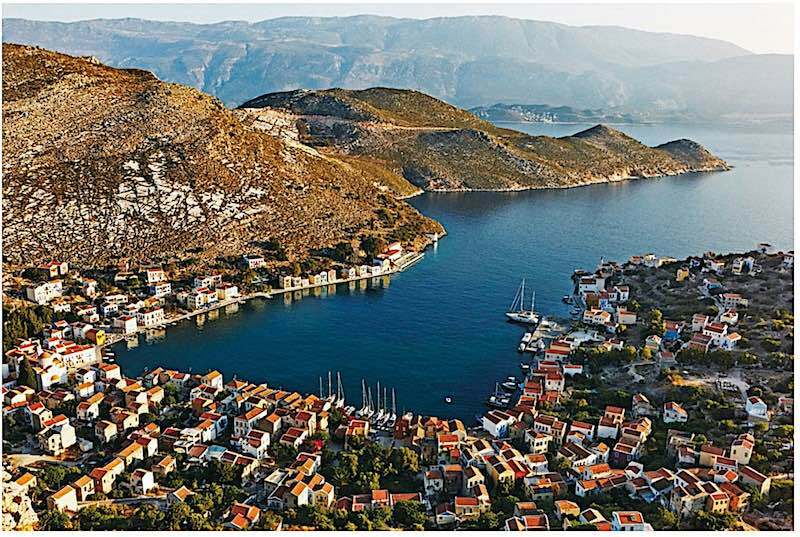 Its citizens, like those in the rest of the world, were gripped with fears of the Cold War between Russia and the West, of the atomic bomb that had ended World War II – and that was likely to start World War III. Cloaked behind the ‘Iron Curtain’ Russians and Communists seemed to be infiltrating everywhere: trade unions, the Communist Party, the 1954 Petrov Russian spy affair, even troops were sent to Malaya in 1956 to fight Communism. It was into this Brisbane environment that George Symons Suits entered – and flourished – in the 1950s. 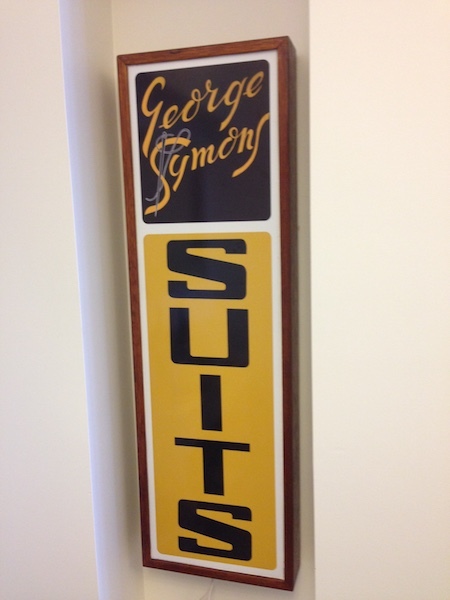 (Peter Ludlow is currently researching the family history of the firm George Symons Suits).